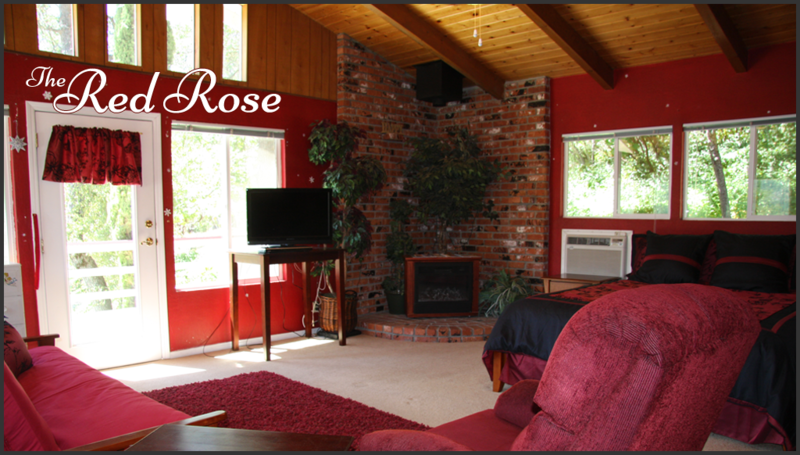 The Red Rose has it all, with a private deck, a log cabin vaulted ceiling, a separate entrance, double sinks, shower, and jetted tub. It also has a luxurious California King bed and a very comfortable futon (full bed). This is a very spacious room with great views that just may include a soaring eagle. This is a great year-round room, and is perfect for holiday get-aways. Keep watching for our special seasonal promotions. 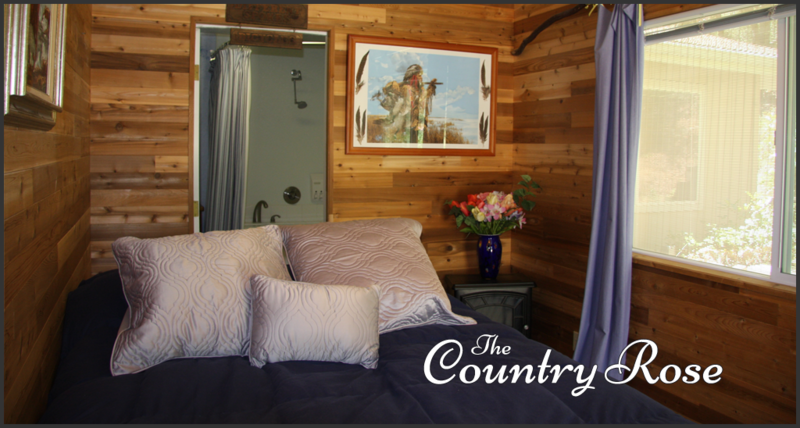 The Country Rose has a bedroom with cedar-lined walls, a plush queen bed, a large Jacuzzi tub, and a private deck with a bistro table. This cozy room, separated from the rest of the house, with its own private entrance, is ideal for a couple who enjoys private moments together. And it's just steps away from an afternoon dip or lazy evening around the swimming pool. People really like this unique room, so book now. The Wild Rose isn't for everyone. Rose herself looks down on the jetted tub with a skylight (no shower) and oversees a "funky" purple room with chocolate-brown accents that connects with the main area of the house, making it easy to be the first to the Keurig coffee maker in the morning for Newman's Own organic coffee. Don't worry. It's easy to get a good night's rest or a power nap in the luxurious queen-sized bed. 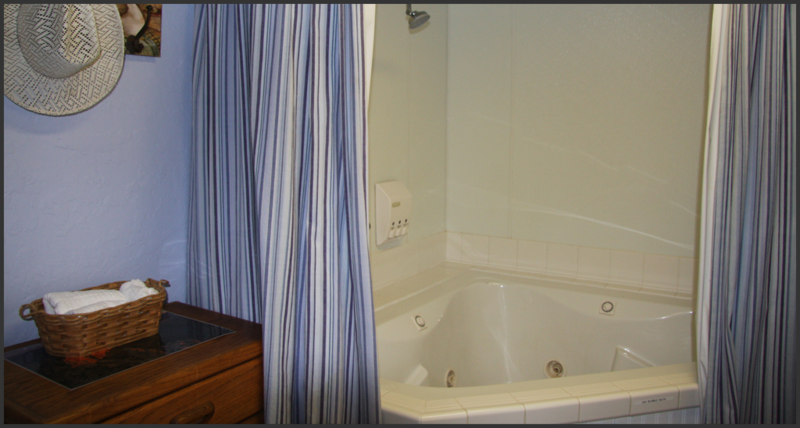 Keep watching for off-season rates on this room. It might be the room for you! -32" TV with HDMI connection, DVD player with a wide selection of free movies available to check-out. -A small guest refrigerator, alarm clock/iPod player, fans and/or air conditioners, although our evenings can be cool at 3200' elevation. -Electric fireplaces add ambiance and comfort to the rooms (when needed). The mornings bring a nutritious, filling breakfast with the possibility of interacting with people from all over the world. Click here now to reserve your place at the table. We could even further prepare you for a glorious day of adventure with a healthy picnic lunch basket. Speaking of food, dinner at a nearby restaurant is just minutes away. Parking is available on our grounds for an RV, trailer, or boat. Water sports are available close by at Bass Lake and other recreational areas. You may want to book as soon as possible, as summers and holidays fill up quickly. 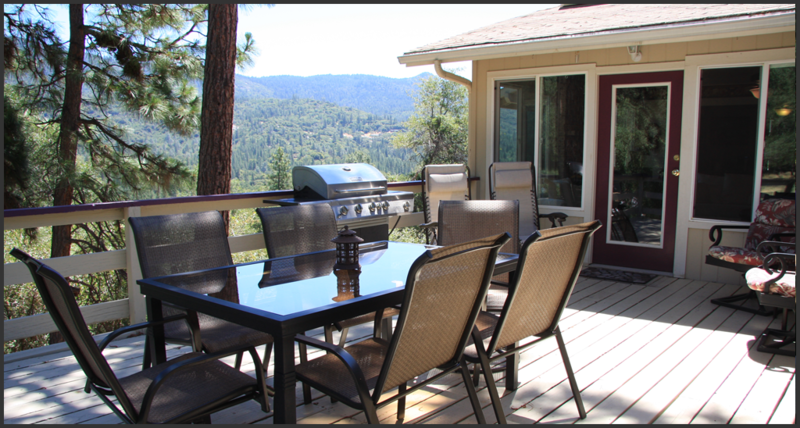 Check out our deck and living area, perfect for morning and evening gatherings, should you wish company and conversation...and do we have the books should you choose to just read, relax by the pool, or take a Sierra Siesta after an exciting day's activities. Men, we even have a small group viewing area to share big sporting events!